The NFC Wild Card playoff game on January 8, 1994 featured two NFC Central rivals that had faced each other the week before to finish out the 1993 regular season. In that instance, the Detroit Lions defeated the Green Bay Packers by a 30-20 score, wrapping up the division title with a 10-6 record. The Packers ended up in third at 9-7 to qualify for a Wild Card slot (Minnesota was also 9-7 and got second place thanks to a season sweep of Green Bay). Detroit was coached by Wayne Fontes and rebounding from a 5-11 record in ’92 after going all the way to the NFC Championship game the year before. RB Barry Sanders, who posted his fifth Pro Bowl season in as many years, was back in action after being lost with a sprained left knee on Thanksgiving that cost him the last five games of the regular season and a shot at the league rushing title. WR Herman Moore was a rising star and WR Brett Perriman was solid on the other side, but quarterback had been a problem area. Following the firing of offensive coordinator Dan Henning after 12 games, Erik Kramer was installed as the starter and performed well. There were injury concerns on defense, which was missing CB Ray Crockett while LB Pat Swilling was playing with a pulled hamstring. The Packers, in their second season under Head Coach Mike Holmgren, were in the playoffs for the first time since 1982. 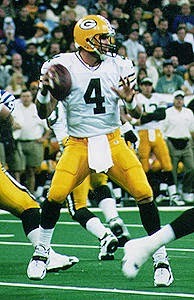 24-year-old QB Brett Favre (pictured above), who had taken over the starting job during the previous year, displayed tremendous potential and was named to the Pro Bowl, but was also inconsistent. He gave up four interceptions in the season-ending loss to the Lions, giving him a league-leading 24 in all, against 19 touchdowns. WR Sterling Sharpe was a consensus first-team All-Pro who caught a NFL-high 112 passes for 1274 yards and 11 TDs, but none of the other receivers were exceptional, nor were the running backs. The defensive line was anchored by DE Reggie White, while Bryce Paup recorded 11 sacks from the outside linebacker position and SS LeRoy Butler was an All-NFL selection. There were 68,479 fans in attendance for the late Saturday afternoon contest at the Pontiac Silverdome. The teams exchanged punts to start the game before the Lions drove to the Green Bay 17 thanks to a pass from Erik Kramer to Brett Perriman that covered 18 yards in a third-and-12 situation and a 25-yard run by Barry Sanders. However, Kramer’s pass intended for Herman Moore was intercepted by CB Terrell Buckley. The Packers had to punt following the ensuing series and the Lions again drove into Green Bay territory, advancing 50 yards in nine plays and not coming up empty. Kramer completed four passes, three of them to Perriman, and a pass interference penalty added nine yards. But Detroit was backed up by a false start penalty, a sack, and a run by Sanders that lost two yards, and while a throw to TE Rodney Holman was completed, it could not overcome a third-and-20 situation. Jason Hanson kicked a 47-yard field goal on the last play of the opening period. The Packers started off the second quarter by putting together a 13-play, 80-yard possession. Brett Favre was successful on four passes and had a ten-yard run along the way. Two of the completions were to Sterling Sharpe, the last of which was good for a 12-yard touchdown. Chris Jacke added the extra point to put the visitors in front by 7-3. The next Detroit series got off to a less-than-promising start when WR Mel Gray, normally an outstanding kick returner, fumbled on the return. The ball bounced back to hit his face mask and went out of bounds at the six yard line. Kramer hit on two passes, to Holman for 16 yards and Perriman for 12, and Sanders took off around end for a gain of 44 yards to the Green Bay 20. A false start moved the Lions back and, following an incomplete pass, Sanders ran for seven yards. Facing third-and-eight, Perriman caught a pass from Kramer for 13 yards to reach the five. Two carries by Sanders got the ball to the one, and from there Kramer threw to Perriman once more for a TD. Hanson’s point after made it a 10-7 tally with just over two minutes remaining in the first half, and that was the score at the intermission. The teams started the third quarter by again trading punts. The Packers were pinned back at their five and Favre threw a pass that was intercepted by CB Melvin Jenkins and returned 15 yards for a TD. Hanson’s conversion put the Lions ahead by ten points at 17-7. Green Bay responded by driving 72 yards in seven plays. Favre completed four passes, including one to TE Ed West for 23 yards and the last to Sharpe for a 28-yard touchdown. Jacke’s extra point reduced the home team’s lead to 17-14. The Lions came back with Kramer throwing to Perriman for 19 yards, an unnecessary roughness penalty that picked up 15 yards on what had been an incompletion, and then another pass to Perriman for 31 yards to the Green Bay eight. Following a three-yard carry by Sanders, Kramer went to the air again, but this time FS George Teague intercepted in the end zone and returned it 101 yards for a TD. Jacke tacked on the PAT, and in stunning fashion the Packers were in the lead by 21-17. As the game headed into the fourth quarter, the Lions put together a 15-play, 89-yard series. Kramer completed four passes and Sanders had a 13-yard run that set up a five-yard touchdown carry by RB Derrick Moore. Hanson added the extra point and Detroit was back in front at 24-21. The Packers had a short possession and punted and the Lions drove to their 44 before they had to punt in turn. There was 2:26 left on the clock as the Green Bay offense regained possession at its 29. Favre threw a screen pass to RB Edgar Bennett for 12 yards and to West for nine. A run by Bennett picked up four more yards and Favre tossed a short pass to Sharpe for another six. 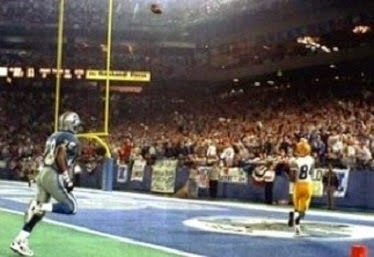 On the next play, Favre was forced to scramble and found Sharpe, alone in the end zone thanks to a blown coverage, for a 40-yard touchdown (pictured below). Jacke’s extra point put Green Bay back in front by four points with 55 seconds to play. The Lions, following a kickoff return of just eight yards by Gray, weren’t able to move past their own 20 in the remaining time and the Packers won by a final score of 28-24. Detroit had wide leads in total yards (410 to 293) and first downs (25 to 16), and was especially dominant on the ground (175 to 89). However, the Lions turned the ball over twice, both in Green Bay territory, to one by the Packers, who also recorded the only four sacks of the game. Special teams were a factor as Corey Harris averaged 29.7 yards on three kickoff returns while Mel Gray was held to 11.0 yards on four returns. Brett Favre completed 15 of 26 passes for 204 yards and three touchdowns while giving up one interception. Sterling Sharpe had 5 catches for 101 yards and all three of the TDs. Darrell Thompson led the Packers with 41 yards on 12 carries and added 32 yards on three pass receptions and Edgar Bennett rushed for 30 yards on 9 attempts while catching two passes for 21 yards. On defense, two of the sacks were accounted for by Reggie White. 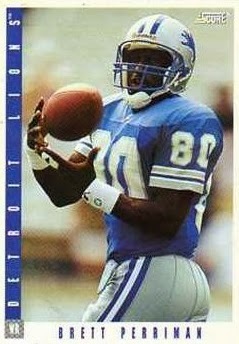 For the Lions, Barry Sanders (pictured above) showed no ill effects from his layoff with 169 yards on 27 carries. Brett Perriman caught 10 passes for 150 yards and a touchdown. Erik Kramer was successful on 22 of 31 throws for 248 yards and a TD, but gave up two interceptions. Following the dramatic win against Detroit, the Packers lost to the Cowboys the next week by a 27-17 score. But after the long postseason dry spell, 1993 marked the first of six straight playoff appearances, two of which resulted in Super Bowl appearances, won of them a victory. The Lions reached the playoffs after each of the next two seasons, losing in the Wild Card round each time, including to the Packers again the next year.